Leads are people for whom you can (or have) record(ed) admissions-related information. "Lead" is not a user role—it is a kind of status that lets you collect admissions information about the person. In order to collect this information, the person must be made a lead. Active leads are given the Active lead system tag. Lead information refers to a specific time period in which the person was a lead. People can be leads at more than one time. For example, you learn about a high school junior who may be interested in your school. For a year and a half you consider him a lead who is interested in a Bachelor's in your Undergraduate Program, but he ultimately decides to attend another school. So, you inactivate him as a lead. Four years later, he sends you an inquiry about graduate studies—so now you start a new lead for him on his profile, this time as one interested in a Master's in your Graduate Program. Both sets of lead information are handled on the same person's Profile > Admissions view, but refer to different times in which he was interested in your school. Leads are assigned to admissions representatives, who are responsible for shepherding the lead through your admissions process. How do I make a person a lead? Click Add a lead in Admissions > Leads > Summary (see below). Via an inquiry—you can create a new lead from the inquiry, or link the inquiry to an existing person. Via an application—just as with inquiries, you can create a new lead or link to an existing person from an online application. Enter the lead's information—at minimum, you need to enter a first and last name. 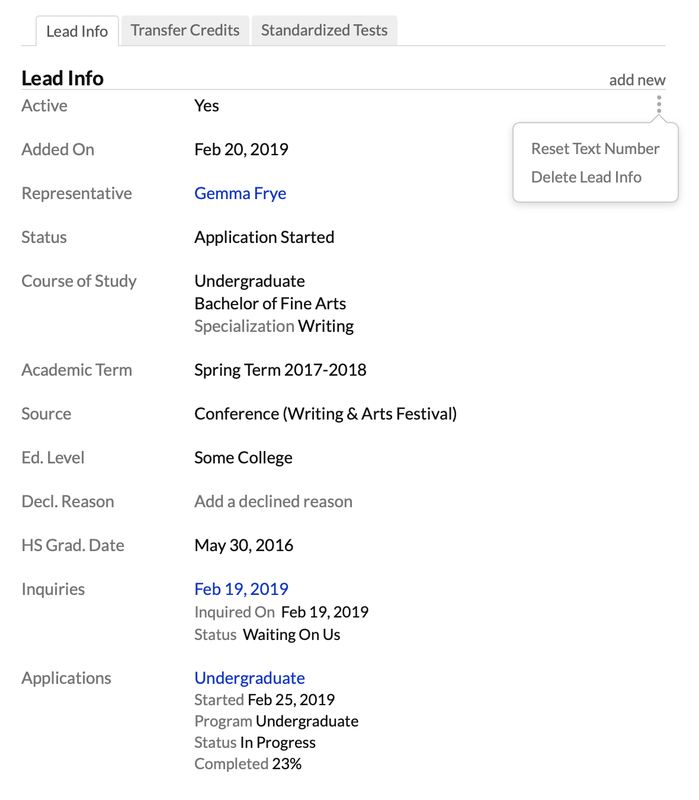 When you're done, click Save to store the lead and go back to the report, or click Save and go to Profile to jump over to the new Lead's Profile > Admissions view. Active Lead is a system tag that fastens itself to any person with an active Lead Info set. Whenever you add a new info set or reactivate an old one, the tag attaches to the person. It is automatically removed when the lead info set is set to inactive. You can manually deactivate lead info at any time. You can also set up enrollment triggers so that Populi deactivates lead info (and removes the tag) in Admissions > Settings > Other Settings. Prospect: A person of whom you are aware who may be interested in applying to your school (although they might not necessarily know about you...). Inquiry: Someone who has been in touch with you in some way—via an inquiry or some other means. This status automatically applies when you link the lead with an inquiry in some way. Application Started: This lead has started an application and is somewhere in the process of working on it. This status automatically applies when either you or he starts an application connected with that lead. Application Completed: The applicant has finished their application and is waiting to hear back from you about a decision. Accepted: You've accepted their application and you're waiting to hear back from them. This status automatically applies when you set their application's status to accepted. Confirmed: They've confirmed that they wish to enroll. Enrolled: The person has actually enrolled in courses at your school. This status automatically applies when they've been registered for a course in an academic term that matches the one entered in their lead info. As soon as a person is a lead, you'll see the Admissions view on their Profile. The Admissions view contains all admissions-related information you have for this person. See How do I make a person a lead?, above, for how to get a person going as a lead. Lead info includes all the admissions information you have about this person for a particular time period. A person can be a lead multiple times in their life—first as an Undergrad, later as a Grad student, for example—so there may be more than one set of lead info. There is only ever one active set of lead info. Other info sets would be inactive (or, all of them might be inactive). If there is more than one set, you can toggle to show Active/Inactive. If an info set is created by linking an inquiry or application to this person, the information collected from the inquiry or application will fill in the info set's fields. Depending on what was collected, some fields may be blank. You can add new lead info to anyone showing the Admissions view on their profile. Go to the Profile > Admissions view. If the person doesn't have the Admissions view, see above for how to make a person a lead in the first place. Next to Lead Info, click add new. Fill in as many details as you have (see Updating active info, just below, for explanations of the fields). After saving, there will be a new active lead info set. Any currently-active info set will be switched to Inactive. Before saving, make sure you want to do this! Delete an info set by clicking . Active: Is the lead someone you're currently pursuing (or soon will be)? If so, make sure this is set to Yes. If this info set is out of the running, set it to No. Keep in mind that you can have only one active lead info set at a time. Reactivating an inactive set will deactivate any currently-active set. Added on: The date on which you added this particular information set. Representative: The admissions representative assigned to this lead. Status: Where the lead is in the Admissions process (see above for explanations of lead Statuses). Program: The academic program the lead is interested in. Academic Term: The term in which the lead plans to begin attending if accepted. Source: The particular Lead Source through which you and the lead first made contact. Ed. Level: The lead's highest education level at the present time. Decl. Reason: If the lead declined to attend, the reason he gave for that decision. HS Grad. Date: If the lead graduated high school (and if that matters to you), the date on which that happened. inquiries: Any inquiries that have been linked to this information set. Applications: Any applications that have been linked to this information set. You can add as many applications to an info set as you need. 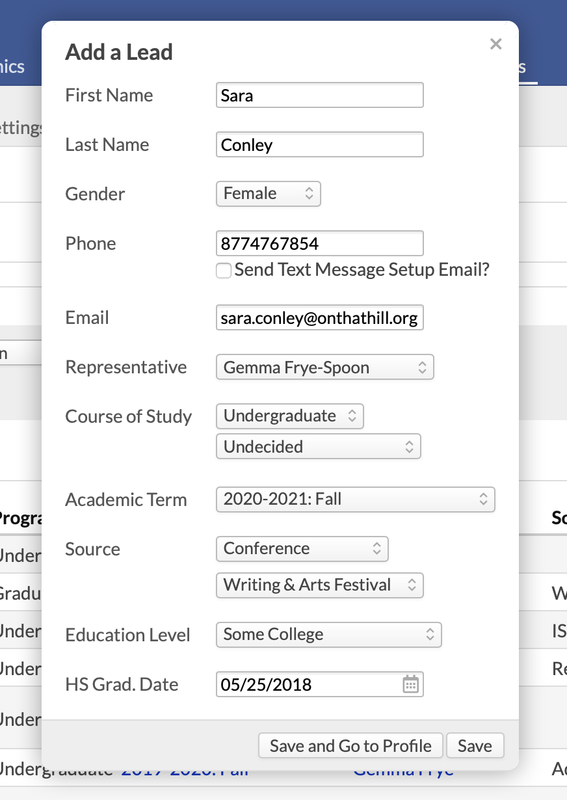 Custom fields are admissions-related info fields that track items not covered in Populi's built-in fields. To add a field, click add next to Custom Fields. Choose a field, enter the details, and Save. You can also use an application field to collect the info for a custom field. When designing an application field, use the link to existing field option and choose the custom field you want the applicant's answer to update. Admissions > Leads includes two reporting tools: Summary and Funnel Report. Leads > Summary report lets you look at anyone with Lead Info in your system, whether active or inactive. Use the filter to get different combinations of information about any leads in the system—yours, those of other representatives, active, inactive, etc. Assign Representative: Select a representative for the leads shown on the report. This article has more details. Add or Remove a Registration Lock: This lets you apply a registration lock to any leads who've been given the Student role (typically, any Lead with a status of accepted, confirmed, or enrolled). Apply or Remove a Communication Plan: Select a plan and the person who is assigning it. Tag or Untag Leads: Type a new tag, or select from the results that appear as you type. You can do this for multiple tags at a time. Email Leads: This opens email in a new window so you can write these leads a message. Text Leads: Lets you send a text message to leads with verified text numbers (those without a number can receive your message via email). Print Letters: This lets you send printed letters to everyone shown on the report. Choose a page layout and format and click Print. If you select .ODT, your letter will be sent to the Print Queue in Communications. Export XLS: Creates a spreadsheet of the leads shown on the report. The Funnel Report shows your admissions "funnel": your leads who proceed through some or all of the Admissions process at your school. It shows when these students enter the funnel and how far they get through it before coming to a decision (whether to quit or apply or accept, etc.). It helps you analyze what factors help your leads proceed or cause them to drop out. It's best to use the Funnel Report to look back on a particular Admissions cycle (rather than analyze a current or future cycle for which you have incomplete data). Use the filter to zero in on particular date ranges, programs, representatives, and other factors. For example, you could see how the leads assigned to a particular representative in the previous six months progressed through the funnel. In the past six months, a large chunk of those who entered at the Application Started status via the Facebook lead Source end up enrolling. Looks like the application form you embedded on Facebook reached a number of highly-motivated leads. One representative shepherded a number of inquiries into the Application Started status, but few of those leads reached Application Completed. Might be a good time to check in with that representative. Of the 1,282 leads from California who entered as Prospects via the Regional High School Visits lead Source, only 10 even ended up inquiring, and none of them even made it past Application Started. Regional high school visits in California appear to be a profound waste of your time.